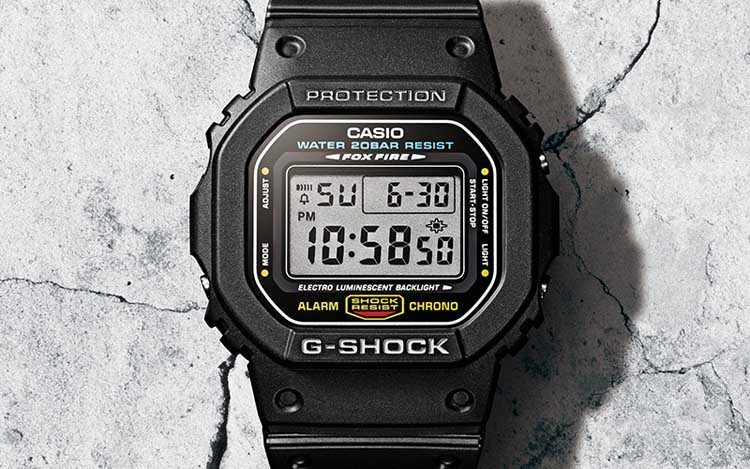 G-Shocks are built stronger and have more features than Casio’s regular watches. But is the difference worth the money? I used to wear a regular Casio F91W for years but switched to a G-Shock about 6 months ago. Here’s why I haven’t looked back since. Casio has multiple watch lines. To keep this comparison simple, I’ll focus on Casio’s digital watches. More specifically, I’ll compare the cheapest G-Shock to the cheapest “regular” Casio watch. G-Shock DW5600E – THE original square G-Shock. 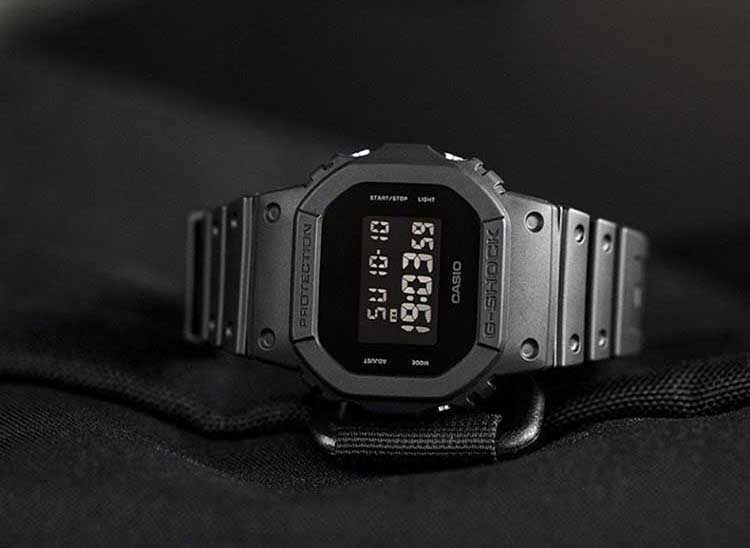 It has more-or-less the same design as the first G-Shock model released in 1983. At roughly $40, the DW56000E is incredibly affordable and has all the “basic” G-Shock features – which makes it perfect for our comparison. 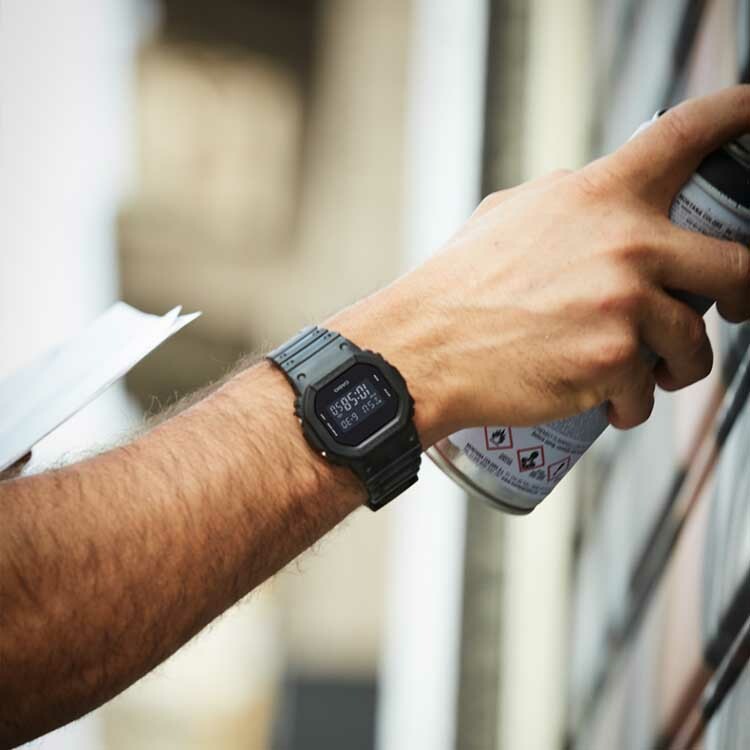 Casio F91W – A legendary digital beater, notoriously known as the “terrorist watch”, and probably the cheapest “reliable” watch in the world. F91W is also one of the most basic watch models from Casio. G-Shock is the toughest watch in the world. You can run a car over your G-shock and it will still be ticking. The inventor of G-Shock, Kikuo Ibe said: “I’m going to build a watch that can survive a 33 ft. fall.” And he succeeded. Casio’s regular watches can’t compete with G-Shocks on toughness, but they’re sturdy enough for daily wear. My cheapo F91W has lasted me for about 2 years. There are some scratches on the screen, but besides them, the watch works as it should. All G-shocks come with 200m of water resistance. It’s more than you’ll ever need, as 70 meters is the deepest you’ll go as a recreational diver. On Casio’s “regular” watches, you usually get 50m of water resistance, which is plenty for swimming and surface diving. However, not all of Casio’s watches have 50m resistance. My F91W, for example, is only marked as “water resist”, which means that it’s not recommended to submerge the watch. Side note: I’ve submerged my F91W many times. After swimming and countless showers, it still works like a charm. The watch is essentially waterproof – as long as you don’t dive with it. It’s surprisingly hard to scratch a G-Shock display. The display is protected by the bezel edges around it. Despite having a cheap mineral crystal display, my DW5600E doesn’t have a single scratch after about 12 months of use. I can’t say the same about Casio’s regular watches. Your display is going to collect scratches like flies – unless you get an expensive sapphire crystal model ($200+). It’s not a huge deal since you can only see these scratches under a certain light. But they add up over time. Unfortunately, cheaper models like F91W don’t have a timer. Which is a shame, since the timer is the feature that I use the most on my G-Shock. More expensive Casio illuminator models come with a timer, though. 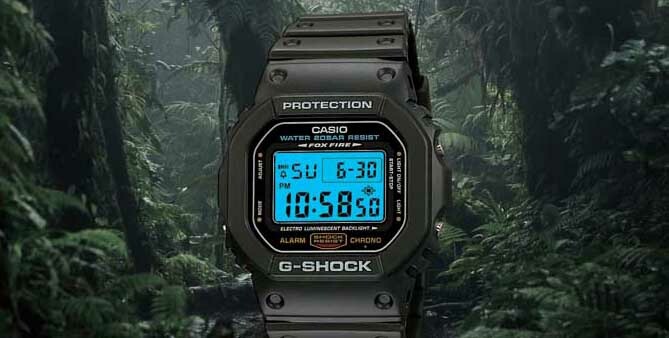 Illuminator backlight is in all G-Shocks and most other digital Casio watches. It works great and the entire screen is illuminated. On some G-Shock models – even the cheaper Mudman G9000 or GD350 – you also get a hands-free backlight mode. Regular backlight you’ll find on cheaper models – such as F91W. The backlight is weak and barely illuminates one side of the watch dial. It’s just enough to see time in the darkness. If you go for a regular Casio, I recommend going for an illuminator backlight model. The biggest downside of the G-Shock is its size. Most models are big and bulky. In fact – that’s why I stayed away from G-Shocks for a long time. I don’t like big watches, and I thought that a G-Shock would look humongous on my wrist. And I wanted a watch that I could wear anywhere. But then I found the DW5600E – one of the smallest G-Shock models around. I can wear it anywhere, and it fits under my shirt sleeve no problem. The size is perfect for my 7.25″ wrist. It’s around 43mm in diameter, not intrusive at all. Casio’s regular watches are generally on the small side. It’s not a problem if you’re used to it, and the smaller size gives the watch a “retro” look. Still, whenever I put on my F91W after having worn the G-Shock, it feels a little too small. G-Shock has more heft, ruggedness, and presence on the wrist. It feels like a “real” watch, while the regular Casios feel more “delicate”. Having the G-Shock on my wrist just feels better. In fact, it’s the main reason why I’ll never go back to wearing a regular Casio again. With that being said, both G-Shocks and regular Casio watches are comfortable to wear. Even a huge G-Shock is comfy, as long as you don’t try to squeeze it under your shirt sleeve. And Casio’s smaller digital watches are a bliss – you can wear them with any outfit. G-Shock has more styles and variety available. You’ve got different colors, analog/digital choices, different sizes etc. Some of the more modern models even work with formal occasions. 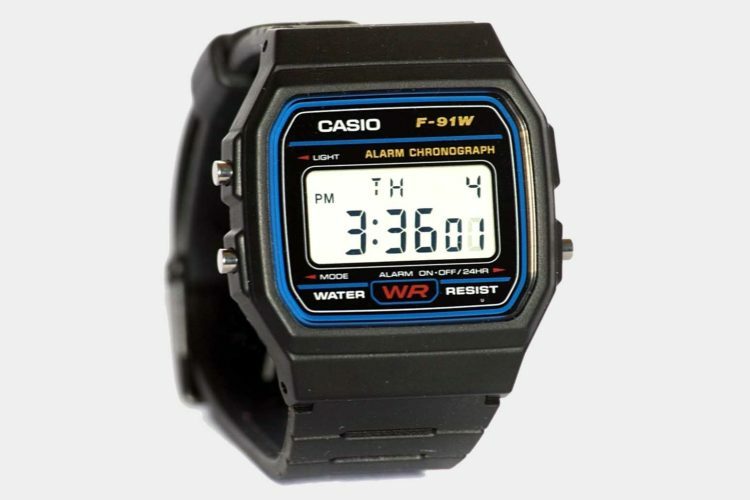 With Casio’s regular digital watches, you only have the “retro” look to choose from. As the cheapest G-Shock can be had at only $40, choosing a regular Casio over it doesn’t make sense. You’re getting more value for your money, and the G-Shock will also last longer. 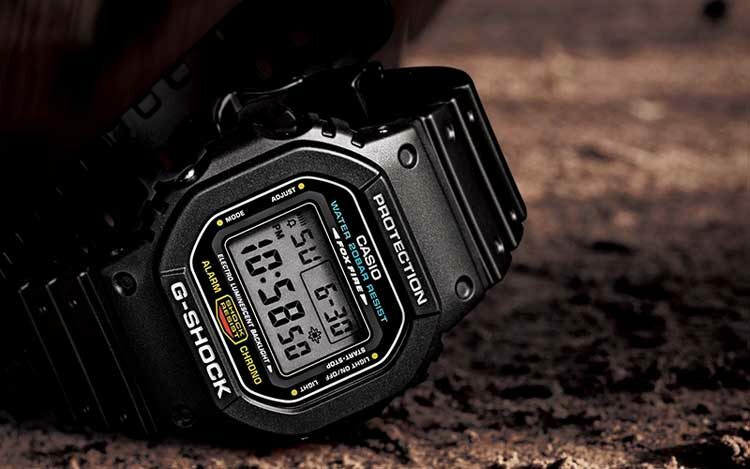 G-Shocks are tougher, but regular Casio watches are sturdy enough for daily wear. 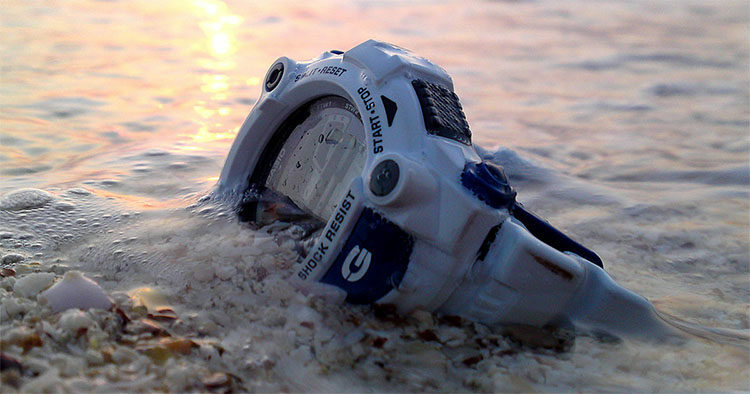 G-Shocks have 200m of water resistance, regular Casio watches have a max of 50m. G-Shock displays are hard to scratch, regular Casio displays are easy to scratch. G-Shock has more styles available, regular digital Casio watches are all “retro”. No difference when it comes to features (except for the cheapest models that lack a timer). If you’re deciding getting a regular Casio watch or a G-Shock, I recommend going with a G-Shock.